Day 1: Arrive in Marrakech. Transfer to your hotel, dinner included. Day 2: Marrakech - Cascades Ouzoud - Azilal - Col Oughbar - Ait Abbes - Ait Bouguemmaz - Agouti - Azib n'Ikkis. 3 hour walk/5hr30min of road. Day 3: Azib n'Ikkis (2300m) - Col Tarkeddit (3450m) - Plateau Tarkeddit (2900m). 5hr30min walk. Day 4: Plateau de Tilibit n'Tarkeddit (2900m) - Sommet du M'goun (4068m). 8hr30min walk. Day 5: Plateau of Tarkedit - Sources of Tassaoute - Col of Sdremt (3200m) - Tazgaiwalt - Amezri - Imin Ikkis. 6 hour walk. Day 6: Imin Ikkis (2100m) - Ichebbaken - Ait Hamza - Ait Ali n' Itto. 6 hour walk. Day 7: Ait Ali n Itto - Megdaz - col 2400m - Tagought - Tizin Fedghat (2500m). 6 hour walk. Day 8: Tizi n Fedghat - Tamzrit - Col Ineghmar (2800m) - Lac Tamda - Azib Anfergal (2600m). 6 hour walk. Day 9: Azib n'Anefergal - Tighza n'Ouaourikt - towards Anemiter - camp in the foot of Tizin Telouat. 5h30min walk. Day 10: Tizi n'Telouat - Bergeries - Titoula - Taddert. 6 hour walk. Day 11: Taddert - Plateau Afra - Village Afra - camp near Assif n Zat. 5 hour walk. Day 12: Afra - Assats - Assif n Zat - gorges - Azgour. 6 hour walk. Day 13: Azgour - Ouarzast Villages and bergeries - plateau of Yagour. 6 hour walk. Day 14: Yagour - Ait Iguerane - Taddert n'Aghbalou - Setti Fadma - camp near Agadir n'Ait Boulemane. 6hr30min walk. 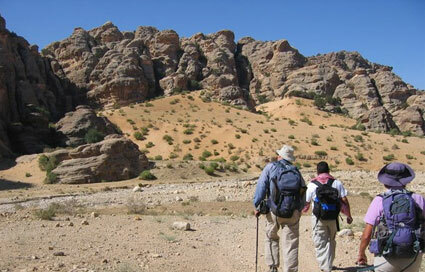 Day 15: Agadir 'Ait Boulemane - Anefli - Gorges Kissaria - Azib n'likkemt (2500m). 6hr30min walk. Day 16: Azib n'Likkemt (2500m) - col Tifni (2900m) - Azib n Tifni - Taghbaloute. 6hr30min walk. Day 17: Taghbaloute - Tissaldai - Amsouert - Ait Iguerane - Chez Balaid - Lac Ifni (2400m) 5hr30min walk. 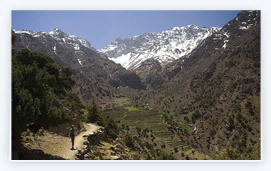 Day 18: Lac Ifni - Col Ouanoums (3700m) - base camp in the foot of Toubkal (3200m) 6 hour walk. 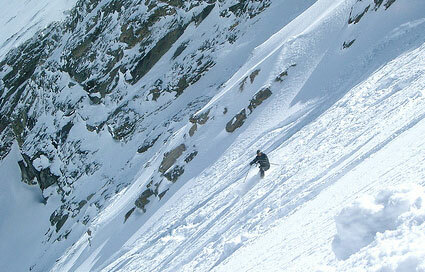 Day 19: Camp (3200m) - Sommet Toubkal (4167m) - back to the same camp (5h) and descent towards Imlil 1750m(3h). 8 hour walk. 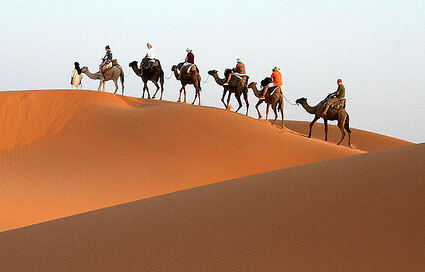 Day 20: Aremd - Asni - return to Marrakech - Hotel base double room and breakfast. 1hr30min transport. Day 21: Free visit in Marrakech or excursion to Essaouira. Day 22: Transfer to aiport for departure.